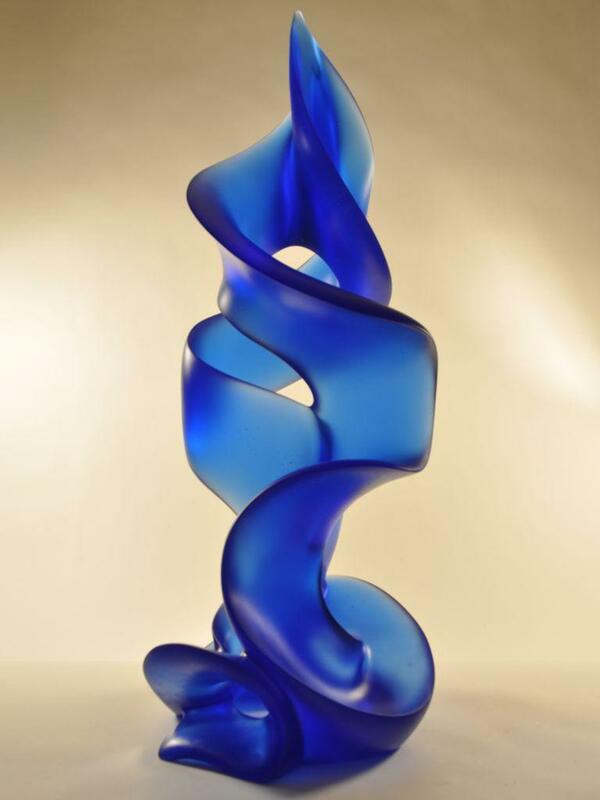 Blue Tango, a spiral glass sculpture, is my largest glass piece to date at 2′-2″ tall. The basic movement of this piece was roughly fixed in my mind before even casting the wax. It needed to be tall and slender with open dynamic upward movement. With balanced positive and negative space and asymmetry. During layout, I envisioned a schematic representation of dance. Convey a male and female figure. He (the taller side) makes a 360 degree turn and the shorter (female) side does a sweeping kick. Technically speaking, the top and bottom of the piece were going to be very strong but the center of the piece is a critical structural element and I had to project my vision through 5 to 6 inches of solid mass, make a strong intersection and then get the two sides to flow well without kinks or flat spots. The second most difficult vision was to get the helical side to spiral a complete turn without distortions. It probably doesn’t look that hard when viewing the final piece. You will just have to take my word on this. Projecting the movement of a 4″ wide ribbon that is 6″ away through solid brown wax makes you wish you had x-ray vision.